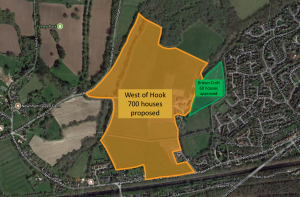 Wilbur Developments have raised an appeal against the decision by Hart DC to refuse the planning application for 700 dwellings at Owens Farm. The appeal process entails a Public Inquiry held by a Planning Inspector who will then make a recommendation to the Secretary of State for Communities who will decide whether the appeal should be allowed. The Secretary of State is involved due to large size of the proposed development. The date of the Public Inquiry has not yet been decided. As you will recall, Hart DC undertook two public consultations on this application. In response, 841 objections were submitted to the first consultation and 741 to the second. This was a great response and clearly shows the strength of feeling from Hook that this development is not welcomed and not wanted. Before the inquiry, the Planning Inspector will receive extensive material from both Wilbur Developments and Hart DC arguing their respective cases. The inspector will also see the previous 1582 objections submitted to Hart and any additional written responses to the appeal – a significant amount of information to absorb. HAAO will be making a comprehensive written response covering all its reasons for refusal of the appeal as a prelude to requesting to speak at the inquiry. We also urge anyone that has not yet objected to do so by 11th Sept using the Planning Inspectorate website (link above) and please share this request to your own families and friends! HAAO will state in our written submission that it has given this advice to residents so that it reduces the amount of duplicated information the Planning Inspector receives but that any lower volume of responses to the appeal (vs. the original consultations) in no way indicates a reduction in the opposition to this application. We will stress that the Hook and Newnham communities continue to feel there are overwhelming reasons to not allow the appeal and that Hook is already being over-developed without adequate measures to improve the infrastructure. To further reinforce the strength of feeling from Hook and Newham residents, we would request as many people as possible to attend as spectators for at least parts of the inquiry, even if only for an hour or so on the first morning. We will advise you when the date of the inquiry is set. 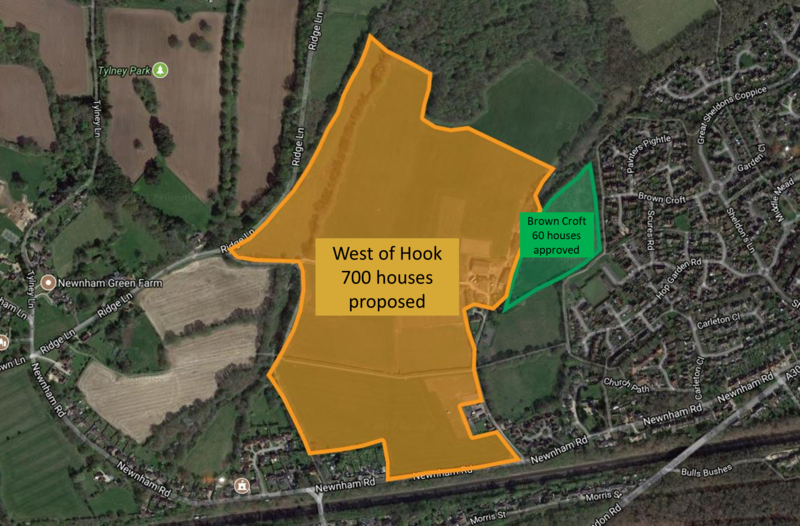 We can always use more support and subject matter expertise to challenge this application, so if you have specific knowledge you believe will help, or simply time to support our investigations, please contact Hook Action Against Overdevelopment directly by email. Also, if you have any questions on the inquiry process, the areas being documented or how you might get further involved, just drop us an email. Thank you very much for your support – hopefully together we can get this application refused.